After lunch at the Crosby Bar, with lots of water and soda to quench our thirst, we headed to the next leg on our Camp Cuyuna team adventure. Our choice of kayaks or paddle boards had been delivered to the new Miner’s Mountain Rally Center at Huntington Feigh Lake. The spacious parking area adjoins a beach, bike parking, picnic and grill stations, changing stations, and restrooms—even a bike mechanic stand. Amenities aside, it was the first time we had all been on a Cuyuna lake. Huntington, like many of the lakes in CCSRA, was once an open mine until nature took over and flooded the abandoned mines. The trees still rooted on the bottom now eerily raise their limbs toward the water’s surface. As Minnesotans accustomed to shallower lakes, it was mind-boggling to grasp that these waters were hundreds of feet deep. And then there was the deep silence—broken only by our voices and the call of the loons. Feeling a bit like explorers, we set out on the water. Some chose to mix it up and took turns on each other’s kayaks and paddle boards. “One of the better ‘work’ days ever,” says Dain Erickson. 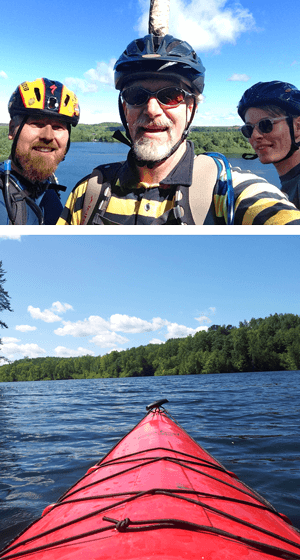 “The aggressive, early bike ride followed by the easy-going afternoon paddle was a perfect mix of activity.” “Some of us even attempted stand-up paddle boarding for the first time—it was awesome and no one fell in!” says Petersen. Yawkey Lake at our yurt’s front door was the perfect backdrop for a convivial evening campfire before heading home. 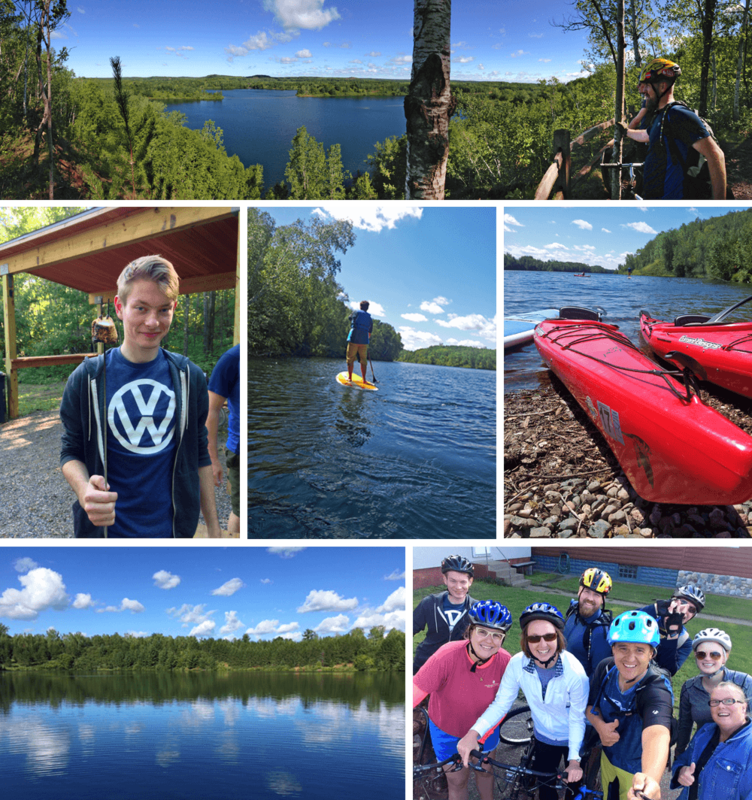 At RedHouseMedia’s Camp Cuyuna day, we discovered the satisfaction of sharing adventures while connecting in new ways with our team—no surveys required.